In 1957 a patient in Long Beach, CA who suffered from multiple cancer tumors the size of oranges was given only days to live. While dying in the hospital he heard that scientists had discovered a horse serum, Krebiozen, that appeared to be very effective against cancer. He begged for them to use it on him. Two months later, Mr. Wright read medical reports that the horse serum was a quack remedy. He suffered an immediate relapse. ”Don’t believe what you read in the papers,” Dr. West told Mr. Wright and injected him with what he said was ”a new super-refined double strength” version of the drug. Actually, it was water, but again, the tumor melted. Mr. Wright was ”the picture of health” for another two months — until he read a definitive report stating that Krebiozen was worthless. He died two days later.” (Blakeslee, 1998). So, what exactly did happen to Mr. Wright? This medical case observed and recorded in a hospital setting is a great illustration of the healing power the brain itself can elicit. This effect is known in medicine as the Placebo Effect. A placebo is a substance or treatment with no active therapeutic effect. Common types of placebos include inert tablets (like sugar pills), or sham treatment procedures. Until recently the Placebo Effect was mostly used as a tool to examine clinical effectiveness of new medications. Every time a new drug is tested its effect is compared to a baseline of placebo or ‘empty’ pill, which was given to patients randomly assigned to a control group. It is accepted as norm that up to 35% of patients who get an empty pill will exhibit the same positive symptoms as patients who received actual medication. Let’s pause for a second – 35%! The health of these patients will improve just because they believed that they took real medication. This is an astonishing number and an incredible healing power stored in the brain itself. Recently scientists started to look on the placebo effect as an important treatment tool which was completely disregarded before (Moerman, 2001; Elsenbruch and Enck, 2015). If we could mobilize and control the healing power of the brain it would greatly speed up patients’ recovery. There are two types of placebo effect: structural healing triggered by placebo application and Placebo Analgesia. Structural healing triggered by application of a placebo is a very mysterious brain healing mechanism which is poorly understood and rarely examined (Meyers and Janowitz, 1989; Moerman, 2001). Mr. Wright’s story is a great example of such structural healing. In this and similar cases changes in the system of beliefs normalized a failing organ or system solely by engaging psychological mechanisms. However, for us as massage therapists, Placebo Analgesia is a much more important subject since we can build our therapy on a foundation which is formed by the Placebo Effect. It will dramatically increase effectiveness of our therapy. Also, Placebo Analgesia is much better understood and studied. Brain imaging as well as other studies confirmed a very fascinating fact. During both opioid analgesia AND the placebo analgesia the same pre-frontal regions of the cortex which are rich with opioid receptors are activated (Holden, C. 2002; Ramos, 2007; Lui et al, 2010). Pre-frontal cortex controls our emotions, abstract thinking and reasoning, memory, attention and eventually our animal instincts. Fig. 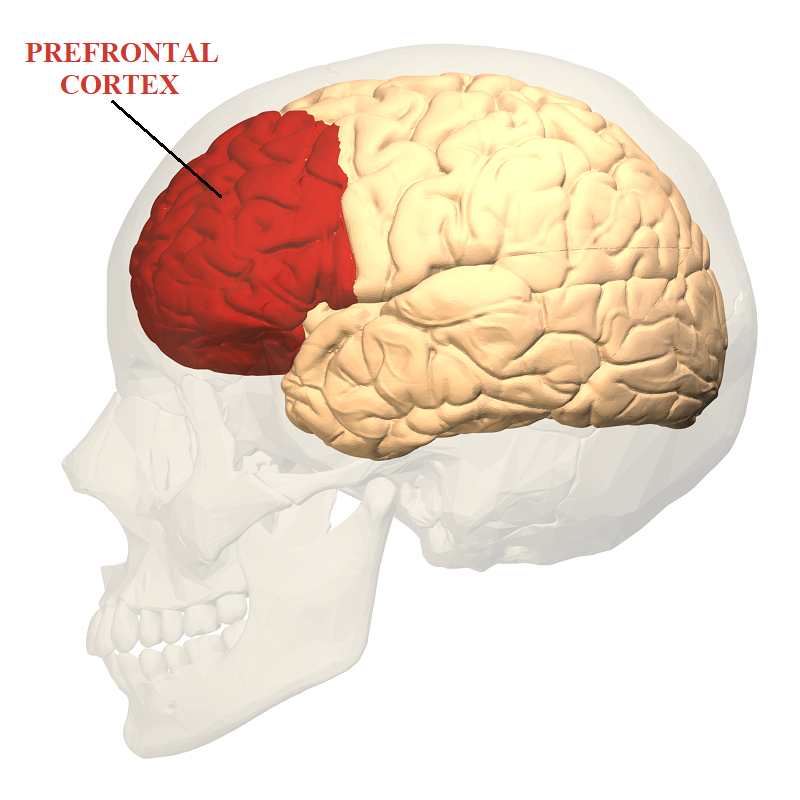 1 illustrates location of pre-frontal cortex in human brain. Despite of similarities there is significant difference in the further developments of events. Opioid Analgesia and Plcaebo EffectHowever, In the case of Opioid Analgesia the cortex elicits an inhibitory effect on the pain analyzing system, affecting the brain stem which is a very old (evolutionarily speaking) part of the brain. In contrast, the Placebo Analgesia triggers pain inhibition engaging the ‘youngest’ parts of the brain called neocortex (Petrovic et al., 2010). Despite that the same parts of the brain are originally activated opioids, work without further cortex involvement while Placebo Analgesia requires a much more complicated chain of events for it to be triggered. In other words, Opioid Analgesia patches the problem while it requires formation of new opioid receptors triggering addiction while Placebo Analgesia engages upper cortical centers which start to re-arrange the entire operation of CNS. We as therapists can’t talk about the Placebo Effect without addressing its counterpart, the Nocebo Effect. The Nocebo Effect or Nocebo Hyperalgesia is an increase in the activity of the pain analyzing system due to additional stress, anxiety or depression. Therapists regularly observe the Nocebo Effect in their practices. The patients with long lasting chronic pain clearly exhibit anxiety, stress and depression because of the long pain experience and failed therapies they went through contributed to a sense of ‘no light at the end of the tunnel.’ In such cases existing chronic pain which comes from the affected organs or tissues is additionally amplified by the brain creating a vicious cycle of never stopping clinical symptoms. The Neuromatrix Theory of Pain proposed by Prof. Melzack is great explanation of the Nocebo Effect (Mezlack). Of course, the degree of Placebo activation varies from patient to patient. It is more important for patients with long lasting chronic pain than for a patient who lets say, yesterday pulled his rotator cuff muscles. I also noticed that when the Placebo effect is successfully triggered, my patients report very unusual feelings. Some will remark that: “It was amazing, I felt something very positive happened inside of me” or “It was absolutely different, mystically different, in comparison with other treatments I had experienced.” Some of my patients suddenly experienced such great sense of relief that medical massage therapy becomes a deeply emotional experience for them. These reactions are not signs of my extra healing abilities. The combination of detailed Evaluation, careful building of interaction with patients, a defensive approach to the affected soft tissues, complete avoidance of activation of the pain analyzing system while the patient’s CNS still rides high on Nocebo Effect, etc. I believe that these and other factors allowed me to trigger the Placebo Effect and woke up the ‘Ultimate Doctor’ in the patient’s brain. Having this powerful physician on my side allowed me to start addressing the problem using local and reflex mechanisms of Medical Massage until stable clinical results were achieved. I believe that healing outcomes of the Placebo Effect are the result of a dramatic increase in the electrical activities in the neocortex and their summation eventually leads to positive changes in function of affected organs and systems. During massage treatment the skillful therapist uses different techniques to massively activate a variety of peripheral receptors located in the different layers of the soft tissues. Thus, besides locally normalizing function of affected soft tissues he or she sends massive sensory input into the CNS which mobilizes neuroplasticity of the brain and alters its electrical activity. Neuroplasticity is the ability of the brain to adjust its electrical activity as a response to repetitive sensory stimulation from peripheral receptors. Observing the profound psychological impact Medical Massage has on patients with chronic pain in our clinic led me to believe that massage therapy activates self-healing processes inside of the patient’s brain similar to the Placebo Effect. However, in contrast with pure Placebo Effect which may or may not be triggered by the cortex, the brain can’t resist and can’t stay indifferent to the huge wave of sensory stimuli we are creating during massage treatment. Therefore, massage therapy has predictable and profound effect on the cortical function and this is why patients with chronic pain see our successful treatments as emotional and even ‘mystical’ experiences. Elsenbruch S, Enck P. Placebo effects and their determinants in gastrointestinal disorders. Nat Rev Gastroenterol Hepatol. 2015 Aug;12(8):472-85. Holden, C. (2002). Drugs and placebos look alike in the brain. Science, 295, 947-948. Meyers S, Janowitz HD. The “natural history” of ulcerative colitis: an analysis of the placebo response. J Clin Gastroenterol. 1989 Feb;11(1):33-7. Kaada B. Nocebo–the opposite of placebo. Tidsskr Nor Laegeforen. 1989 Mar 10;109(7-8):814-21. Lui F, Colloca L, Duzzi D, Anchisi D, Benedetti F, Porro CA.Neural bases of conditioned placebo analgesia. Pain. 2010 Dec;151(3):816-24. Moerman, D.E. (2001). Cultural variation in the placebo effect: Ulcers, anxiety, and blood pressure. Medical Anthropology Quarterly, 14:1, 51-72. Petrovic P, Kalso E, Petersson KM, Andersson J, Fransson P, Ingvar M. A prefrontal non-opioid mechanism in placebo analgesia. Pain. 2010 Jul;150(1):59-65. Ramos JM. Placebo effect and pain: brain bases. Neurologia. 2007 Mar;22(2):99-105.